Each November 2, the Chicago Waldorf School celebrates El Dia De Los Muertos, also called ‘All Souls Day’ and ‘The Day of the Dead’. 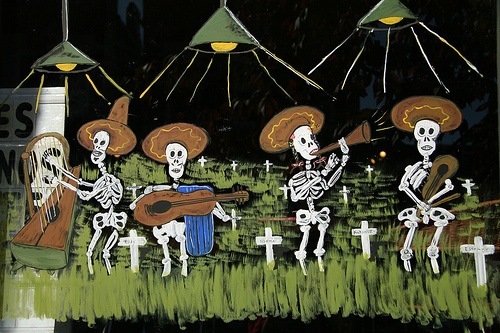 El Día de los Muertos is a ritual, a time to honor loved ones who have died and to acknowledge death as a part of life. Our school builds an ofrenda, an altar beautifully decorated, to honor loved ones and to share the pictures of loved ones that have passed. Photographs of Cole’s dad and grandparents take their place on the ofrenda, alongside the photos of the dearly departed loved ones of other family members in our communities. It’s not a sad time, it’s a remembering time; it’s a time of storytelling. El Día de los Muertos celebrations provide the perfect opportunity for connecting with the “thinning of the veil between worlds,” celebrating and remembering loved ones who have passed on to another realm. 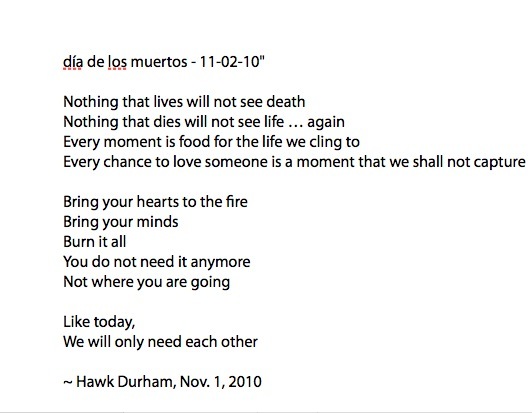 Our friend, Hawk wrote this poem for me to share with you in honor of El Día de los Muertos. Read Hawk’s love poem aloud. It’s magical. Today, I stopped at our neighborhood church to light a candle for Joe. As I was leaving the church, an old, church lady whom I had never met stopped me, holding her hand against my cheek, she whispered, “He lives in your memories.” I stared at her, for but a moment, before she slowly continued her walk down the church aisle. How do you celebrate your dearly departed loved one’s? Such talent Hawk. I dont really celebrate the dead. We remember them. We put flowers on there graves. We dont forget them ever. We remember them in our hearts and minds. Cherish the memories we have. I have never heard of this tradition. But this nice lady sure gave you words of comfort. Memories are all that is left after we are gone. Thats our comfort. 😐 Great idea and great comfort for you and Cole to have a wonderful tradition. I think memories are one of the best celebrations! I love the post where you shared how your grandmother would suggest your mom and her sister walk over to play on “grand pa’s grave.” Its wonderful Cole can attend a school that is open to honoring so many different kinds of celebrations. Joe does love Milky Ways! Sugar Skulls are mostly just sugar! The reminded me of a rock candy. I love that are school has such an open festival life! My most favourite person in the world, my mother, died over 24 years ago. We use the anniversary of her death to celebrate her life. Every year we (my sisters and dad) go to mass together, then we all gather at Dad’s house for lunch, each of us preparing food to share and we talk and laugh about our stories of Mum. We haven’t missed a year yet and it’s been great for my kids too as they never got to meet her. Hawk, what a beautiful poem! Let’s cherish what we have here and now, and make each day count because we can never get it back. How lovely Antoinette! What a heartfelt way to honor “your most favorite person in the world” I bet your mom is so pleased that she raised daughters that honor her memory by choosing to be together with their dad. we used to do this service when i was a kid at church. It is magical–the connection, memories, and sharing make the day very special. Thanks for dropping by Odd, Art! I agree with Katybeth Hawk your poem is magical just like the author. We honor our dead on the one year anniversary but then we let go. We remember naturally but not formally. Life is for the living and we focus on the future. We don’t forget by any means but we simply always look forward to the next generation. Remembering naturally, and telling stories of those that have passed is such a wonderful gift to the next generation. Day of the Dead! Greetings From The Beyond!